Things went as planned in this Friday’s quads. 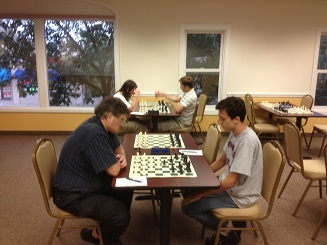 After two rounds, National Masters Ian Harris and Daniel Lowinger were tied with 2/2 in the top quad. In the end, Harris earned the final point and won the section. Ryan Young also had an impressive run finishing 3/3. Vladimir Kotov and Melvin Patrick tied for second.